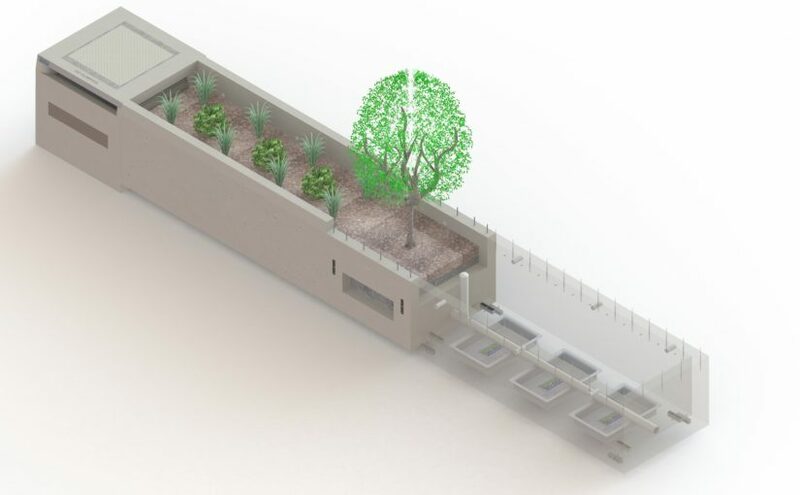 Oldcastle Infrastructure is pleased to announce the BioMod® Modular Bioretention System has received equivalency approval from the Washington State Department of Ecology as a stormwater bioretention planter or planter box. By granting the BioMod “functional equivalency”, Ecology has formally recognized that Oldcastle’s precast bioretention system does not need to go through the Technology Assessment Protocol – Ecology (TAPE) program for approval, and may be designed using the same standards and criteria as any non-proprietary bioretention planter or planter box. Designers can work directly with Oldcastle Infrastructure to include the BioMod system on project plans to meet Ecology’s or any other agency’s requirements for bioretention in a complete and pre-assembled precast system. The BioMod system is a conventional, vegetated bioretention system designed as a series of modular precast concrete sections which are filled with layers of mulch, bioretention media, and drain rock. Standard components include both trench and end modules as well as modules for various inlet configurations, pretreatment, and high-flow bypass. The number and size of the modules, as well as the overall configuration of each system, is determined on a site-specific basis. In addition, the BioMod system can be configured as a stand-alone planter box consisting of a single concrete module. Trench modules can be provided with open bottoms to promote infiltration onsite or with closed bottoms and underdrains to connect to downstream storm drains. The BioMod system typically incorporates non-proprietary, low flow rate media with media components and thicknesses specified by the local regulatory agency. A wide variety of plants or trees may be used in the BioMod system. Plantings appropriate for the local area are typically specified by the designer. CRH (LSE: CRH, ISE: CRG, NYSE: CRH) is a leading global diversified building materials group, employing c.85,000 people at c.3,600 operating locations in 32 countries worldwide. With a market capitalisation of c.€23 billion (April 2018), CRH is the largest building materials company in North America and the second largest worldwide. The Group has leadership positions in Europe as well as established strategic positions in the emerging economic regions of Asia and South America. CRH is committed to improving the built environment through the delivery of superior materials and products for the construction and maintenance of infrastructure, housing and commercial projects. A Fortune 500 company, CRH is a constituent member of the FTSE 100 index, the EURO STOXX 50 index, the ISEQ 20 and the Dow Jones Sustainability Index (DJSI) Europe. CRH’s American Depositary Shares are listed on the NYSE.